This dish is the most indigenous in the Philippines. It has evolved over the centuries as a way of preparing foods that won’t spoil easily in a tropical climate. The vinegar gives it the tangy taste and acts as the preservative. Each region has its own version, but the most commonly used is pork and/or chicken. 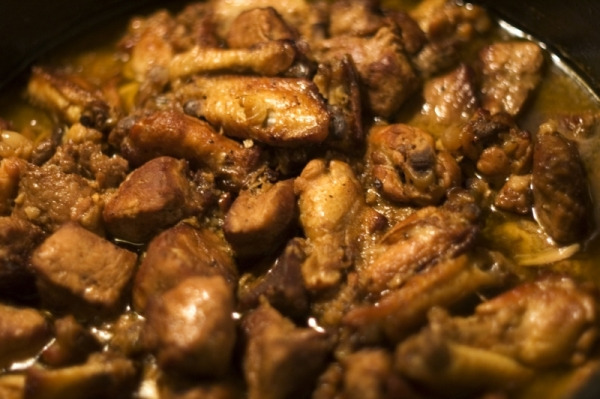 The steps below is the traditional way of making adobo (Chiken adobo or Pork adobo). When chicken is cooked, put chicken pieces in a colander and drain. Put aside the pot with soy sauce and vinegar. Sear the chicken and brown them on all sides. Put chicken pieces back in the pot with soy sauce and vinegar and bring to simmer.Add 1-2 pieces of bay leaf. Cook until the sauce has largely evaporated; some take this to an extreme and cook until the sauce has thickened and adhered to the chicken, which begins to make a popping noise due to the high, direct heat. Serve over hot steamed rice. May be eaten with tomato slices in fish sauce.